In the 2010 mid-term elections, Republicans won control of the North Carolina General Assembly for the first time in over a century -- and Republican mega-donor Art Pope could claim at least some of the credit. As Facing South documented, and later pieces by The Independent Weekly and The New Yorker amplified, Pope's election spending in 2010 -- at least $758,000 from his family fortune and corporate treasury -- and network of conservative organizations were key to the GOP's capture of the N.C. legislature. Two years later, North Carolina has elected its first Republican governor in more than two decades, the GOP has expanded its control of the legislature -- and once again, Art Pope's fingerprints are everywhere. According to campaign finance records filed so far (final reports won't be disclosed until January 2013), it appears Pope's family and business, the discount retail chain Variety Wholesalers, may have put slightly less money into N.C. state elections than they did in 2010, when Pope's massive spending on behalf of Republicans ignited widespread controversy. But a Facing South/Institute for Southern Studies analysis of state and federal records finds that Pope's investment in North Carolina politics this year was still substantial, part of a year that saw record-breaking amounts of money flooding into races at the local, state and federal level. Start with the Pope family. According to the latest campaign finance records, Art Pope, wife Katherine and sister Amanda Pope contributed more than $218,000 to state-level candidates in North Carolina for the 2012 election cycle. The biggest beneficiaries of the Pope family's donations were the state Republican Party ($125,000), Governor-elect Pat McCrory ($20,000) and the GOP office in Wake County, N.C., where Pope lives ($15,050). 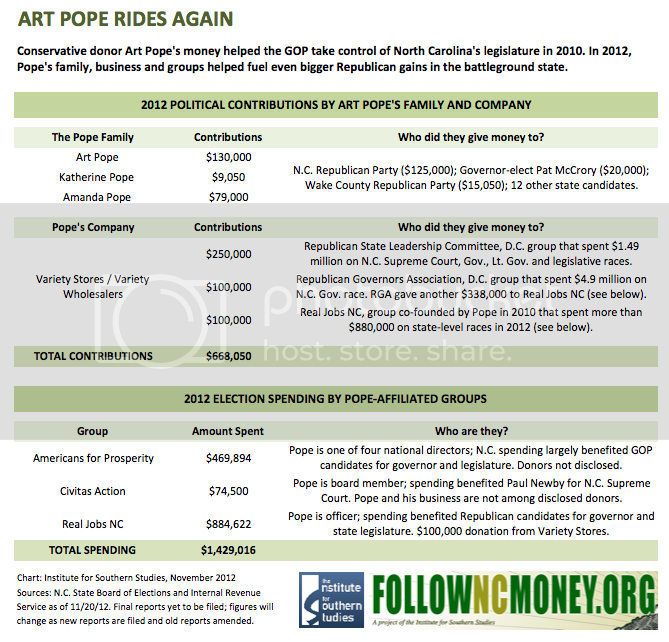 In 2010, Pope family members spent $252,000 on 19 state legislative races, most of them elections also targeted by independent political groups backed by Art Pope. In 2012, the Pope family's individual contributions focused less on the General Assembly -- already solidly in Republican hands -- and were aimed at other state contests. Aside from their heavy investment in McCrory, the Popes also spent $12,000 in the unsuccessful bid to elect Mike Causey, the GOP hopeful for insurance commissioner, and $8,000 on Dan Forest, who narrowly won the race for Lt. Governor. In 2010, Pope was a national leader in using independent spending committees to influence state-level politics. Three groups backed by Pope's business Variety Wholesalers accounted for 75 percent of the outside spending that flooded into North Carolina's mid-term legislative elections. Outside political groups again played a big role in North Carolina politics this year: According to the Institute's money-tracking website FollowNCMoney.org, outside groups spent more than $14 million on state-level races in 2012. * Real Jobs NC, a group founded in 2010 and whose board Pope sits on, was one of the biggest players in N.C. state races in 2012. According to reports filed so far, Real Jobs spent $884,622 on state-level contests this year. Governor-elect Pat McCrory was by far the biggest beneficiary of Real Jobs NC's spending, receiving more than $380,000 worth of expenditures that benefited his campaign. Pope's company Variety Wholesalers put $100,000 into Real Jobs NC. As in 2010, the group also benefited from the backing of national heavyweights including the Republican Governors Association and Republican State Leadership Committee (RSLC). Variety also gave $250,000 directly to the RSLC, which in turn funneled $1.49 million into other outside spending groups in North Carolina, most notably Justice for All NC -- a super PAC that directly and indirectly bankrolled ads benefiting conservative justice Paul Newby in the money-drenched race for a N.C. Supreme Court seat. * Americans for Prosperity, the national Tea Party group where Pope is one of four national directors, spent nearly $470,000 on state-level races in North Carolina. Top targets for the group in North Carolina in 2012 included the governor's race, where AFP spent $130,000 benefiting Pat McCrory -- who had traveled the state speaking for the group after his election loss in 2008 -- and the state Supreme Court contest, where the group spent $225,000 to benefit Newby. As a so-called 501c4 nonprofit, AFP doesn't have to disclose its donors, so the level of Pope's support is unknown. But aside from his top leadership role in the group, Pope's family foundation is also the second-largest backer of AFP's sister group, the Americans for Prosperity Foundation. * Civitas Action is the election-spending arm of the John W. Pope Civitas Institute, a conservative think tank largely funded by Art Pope's family foundation. Pope also serves on the board of both Civitas Action and the Civitas Institute. Civitas Action aimed all of its $74,500 spent in 2012 at helping Paul Newby win re-election to the N.C. Supreme Court. * The Washington, D.C.-based Republican Governors Association was the biggest outside spending group in North Carolina state races this year, pumping $4.9 million into the effort to elect Pat McCrory. The RGA also funneled $338,000 into Pope's group Real Jobs N.C. Pope's Variety Wholesalers made a $100,000 contribution to the RGA in December 2011. Other groups with indirect Pope connections were involved in North Carolina's state elections. For example, Americans for Tax Reform, a so-called 501c4 group headquartered in D.C. spent $42,975 on three state legislative races. The group isn't required to disclose its donors; however, Internal Revenue Service tax records show that the John W. Pope Foundation, which Art Pope runs, has given $122,500 to ATR's 501c3 sister group, the Americans for Tax Reform Foundation. Art Pope's generosity and critical role in fueling the Republican Party's resurgence in North Carolina appeared to be quickly rewarded. Days after the election, Governor-elect Pat McCrory hosted a news conference to unveil his transition team and plans for his upcoming term. Joining him onstage was none other than Art Pope, who was listed as one of the "co-chairs" of the transition group. * Thomas Stith, who is leading McCrory's transition team. Stith is a former staffer at Pope's Civitas Institute, and Pope backed Stith's campaigns for political office in Durham, N.C.
* Jack Hawke is a member of the transition team's leadership. Hawke is a long-time Pope associate and former president of the Civitas Institute. * The transition team's lawyer is Lindsey Wakely. She worked at the N.C. Institute for Constitutional Law, a group almost entirely funded by Pope's family foundation, and is former legal counsel to Pope's company, Variety Wholesalers. McCrory's Pope-dominated coterie immediately drew criticism. The state NAACP fired off a letter to McCrory expressing concern over the inclusion of "ultra conservative" Art Pope on the transition roster. Democratic strategist Gary Pearce saw it as a publicity misstep: "[T]he media immediately focused on whether Art Pope & Co. will run McCrory’s administration." As for McCrory, he has brushed off accusations that Pope's involvement has anything to do with the money and resources Pope deployed to help him get elected, saying Pope was picked because he's "extremely knowledgeable about the operation of state government."